“I saw the best minds of my generation destroyed by werewolf movies.” Okay, wrong Howl perhaps, but aside from An American Werewolf in London (1981) and the genre-twisting The Company of Wolves (1984), the werewolf has probably been the patchiest movie monster to prowl the cinema. Since Lon Chaney Jr. first growled at the gibbous moon in 1941 we’ve had Albert Finney in The Howling (1981), Jack Nicholson in Wolf (1994), the 2010 remake of The Wolfman and Michael J. Fox-starring Teen Wolf (1985). As became apparent with Twilight, Team Vampire beat Team Werewolf hands down and now the zombies are lumbering into a dominance verging on the ubiquitous. 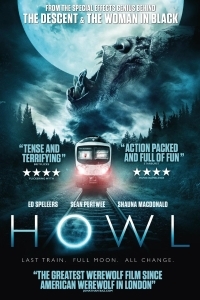 So it’s refreshing to see a low budget British horror like Paul Hyett’s Howl (2015) take a vicious bite out of a neglected sub-genre. Ed Speleer plays Joe, a train guard with ideas about his station. He simply wants to be a supervisor but he’s out of luck even with that modest ambition and to make matters worse the guard who gets the promotion forces him into working late. A disconsolate Joe finds himself heading into the dark nether reaches of wherever it is trains go when they are not in London (Eastbourne presumably). The passengers are a cross section of Cameron’s Britain: a stressed career woman (Shauna MacDonald), a sleazy businessman (Elliot Cowan), a fast-food-guzzling slob, a nerd, the decent old couple with anxiety and low blood pressure and the girl with the noisy headphones and the attitude. There’s the glimmer of a silver-lining with the company of colleague Ellen (Holly Weston), running the food trolley, but this quickly clouds over as she makes it clear that she’s not interested. When the train grinds to a sudden halt and a long delay is promised, the horrors of rail travel would be enough but something else is howling in the woods. Hyett and screenwriters Nick Ostler and Mark Huckerby do well to give Howl an original and low key setting. The situation is redolent with some wry state-of-the-nation humour as the passengers get crotchety and the train driver (Sean Pertwee) goes AWOL. It soon becomes more than apparent that there’s something horrible lurking in the woods. Hyett does his best to keep his lycanthrope in the shadows and the trees for as long as possible, allowing his characters to argue, fight and worry, before the butchery begins. The second half of the film is as modestly ambitious as its protagonist, content to let the characters follow their predictable arcs as they get picked off one by one. In ditching some of the sillier elements of the werewolf mythos (silver bullets etc. ), Hyett and his screenwriters risk making the beast into basically just an animal – something the elderly passenger (Duncan Preston) points out – or, with the contagion subplot, basically a hirsute zombie. As such the werewolf doesn’t have a personality and Howl ultimately suffers from as well, never quite sure how serious to take its own characters and their predicament and yet never going the full on B-movie parody root.